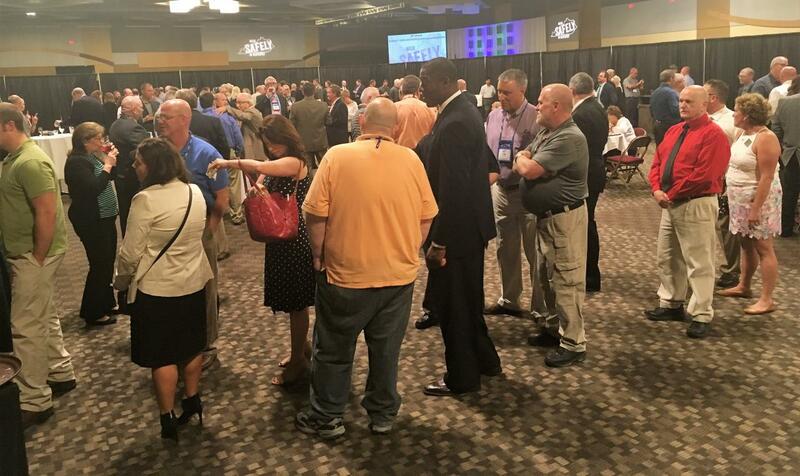 The largest annual gathering of workplace safety professionals from companies all across Kentucky took place in Covington this week at the state’s premier occupational safety and health event. Labor Secretary Derrick Ramsey (right) speaks with Matt Monroe of Calvert City’s Wacker Polymers at Thursday’s banquet. Wacker Polymers has logged 514,582 hours,which represents about two years or work for the company of 150 employees, without a lost-time accident or illness (photos by Mark Hansel). The Northern Kentucky Convention Center was the site for the 33rd Annual Governor’s Safety and Health Conference and Exposition. It was the first time the conference has taken place in Northern Kentucky. Kentucky celebrated the safest year in the workplace in its history in 2015, the most recent year for which statistics re available. The weeklong event, themed “Made Safely in Kentucky,” was co-hosted by the Kentucky Safety and Health Network, Inc. and the Kentucky Labor Cabinet. Representatives from 48 companies that earned the prestigious Governor’s Safety and Health Award were in attendance to help celebrate Kentucky’ all-time low Injury and Illness Rate. Labor Secretary Derrick Ramsey presented the awards to recipients prior to a Thursday banquet. Among those receiving recognition was Florence-based Firestone Building products, which has logged 299,678 hours without a lost-time injury or illness. Air Products & Chemicals of Calvert City led all companies in attendance with a remarkable 11,892,960 hours without a lost-time injury or illness. This year’s conference also featured $ 40,000 in Scholastic Achievement for Education (SAFE) Award scholarships to college students. An additional $ 20,000 will go toward a new initiative to train thousands of students who will graduate from high school with an OSHA 10-Hour card. The Labor Cabinet’s Division of Occupational Safety & Health Education & Training leads the Cabinet’s proactive efforts to create safe and healthful workplace conditions. This includes overseeing the new web-based training service eTrain . The online training module will offer a variety of safety and health training topics, certificates, and live and recorded webinars at no charge. 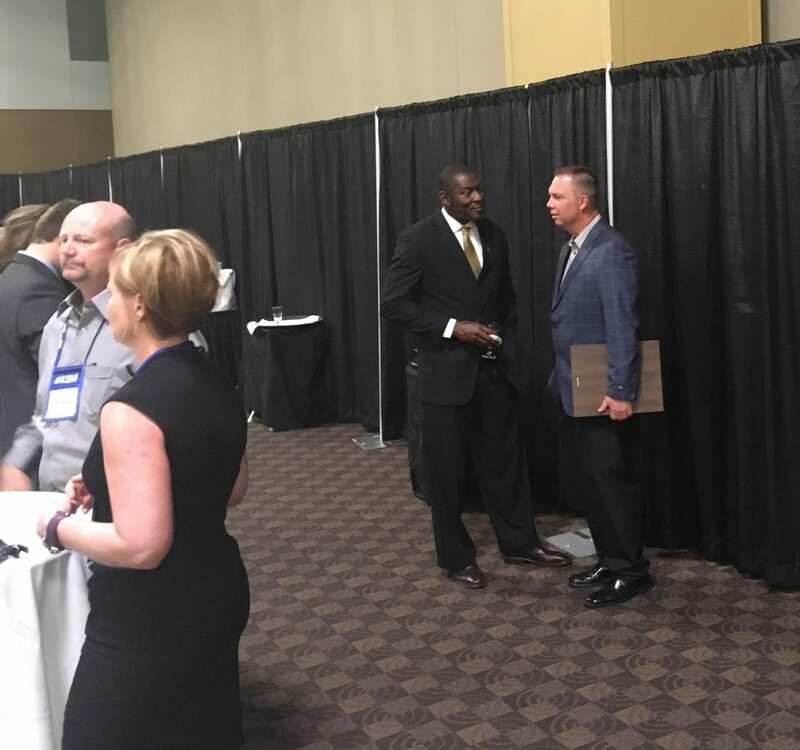 Representatives from companies throughout the Commonwealth were in attendance at the 33rd Annual Governor’s Safety and Health Conference and Exposition in Covington this week. Companies that achieved milestones in workplace health and safety were recognized at an event Thursday at the Northern Kentucky Convention Center. In addition to eTrain, the Cabinet provides free consultative services to employers across Kentucky on ways to increase workplace safety – including how to improve injury and illness rates. Services included the free on-site consultations to all employers as well as other compliance assistance, educational materials and class-style training. Last Year, the Division conducted 350 free on-site visits, or consultative surveys in Kentucky. As a result, employers, corrected 3,813 serious conditions that could have affected up to 108,307 employees and potentially resulted in enforcement penalties of up to $ 26.69 million. Based on a mathematical calculation from a recent Bureau of Labor Statistics report that describes the number of recordable incidents per 100 full-time employees, Kentucky’s rate improved from 3.8 in 2014 to 3.7 in 2015. The report reflects the most recent data available and is the lowest rate in the state’s history. The rate has steadily declined from 8.4 since it was first calculated in 1996.